With very few exceptions, I have been flying home each year to celebrate the Parental Units' anniversary. Usually this involves the three of us at a fine dining restaurant, where I also pop open a bottle of wine from their anniversary vintage. We've been doing this for a number of years now, and we've basically been rotating through three restaurants over time. This year, however, mom had different ideas. I was honestly surprised when she told me that she wanted to go to RAW. 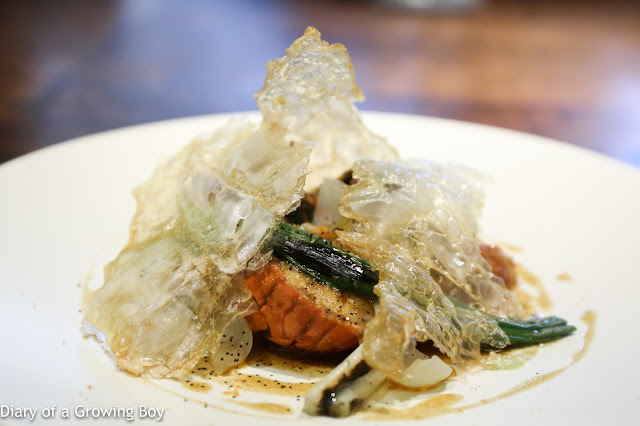 Now, I do really like the food I've had at RAW, and of course being one of Andre Chiang's restaurant gives it a huge halo - making it one of the toughest places in town to score a table. So it's natural that mom would be curious about the food. But I never considered taking mom there simply because they only do tasting menus, and that's waaay too much food to stuff into mom's stomach. As much as she loves to eat, she only ever manages to do maybe 3 dishes at dinner, so it's always been à la carte for her. But she wasn't gonna change her mind, and she wanted to invite a few friends along. So... knowing how tough it is to score a table - and with dad being put on the waiting list - I asked for help. I was ever so grateful that the favor came through, and we got ourselves one of the chef's tables for tonight. We had a pretty interesting crowd tonight... The eight of us ranged from early 20s to late 80s, and I figured the average age was about 65. A couple of us have very small appetites, so the youngest member was obligated to help put away some of the food. And there was plenty of food to be had! 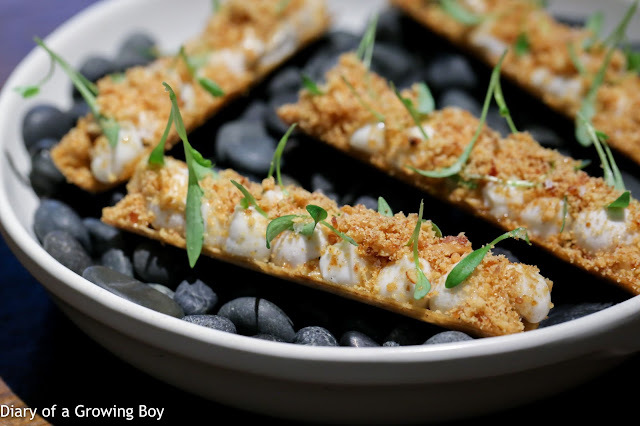 Taro, peanut, coriander - we start with a plate of pretty-lookin' finger food. On top of the crispy spring roll wrapper was a layer of taro mousse with peanut butter, with diced taro bits mixed in. 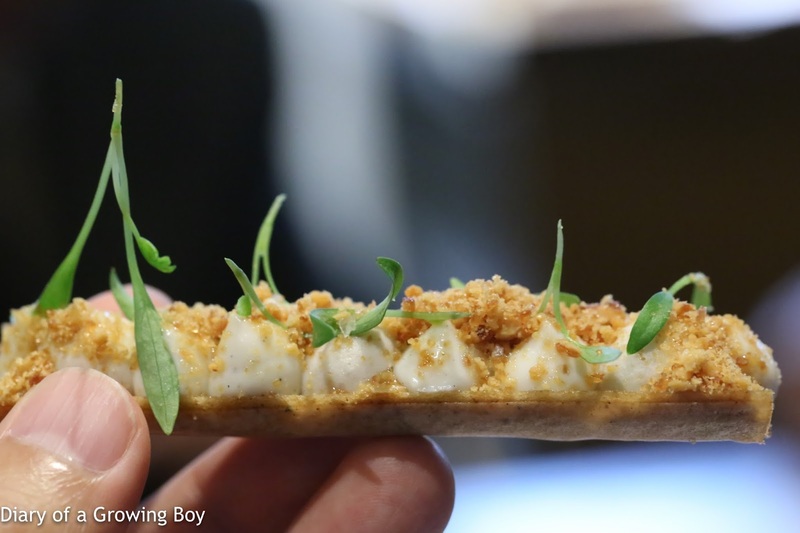 Sprinkled with powdered peanut butter brittle from Yilan (宜蘭), and garnished with baby coriander. Inhaled in two bites. Pretty tasty. I gotta say that I didn't taste much of the taro, because the peanut flavors from the powder just overpowered everything. Not that I'm complaining, because I just loooove the combination of sweet and savory flavors... and that richness and fragrance from roasted peanuts. 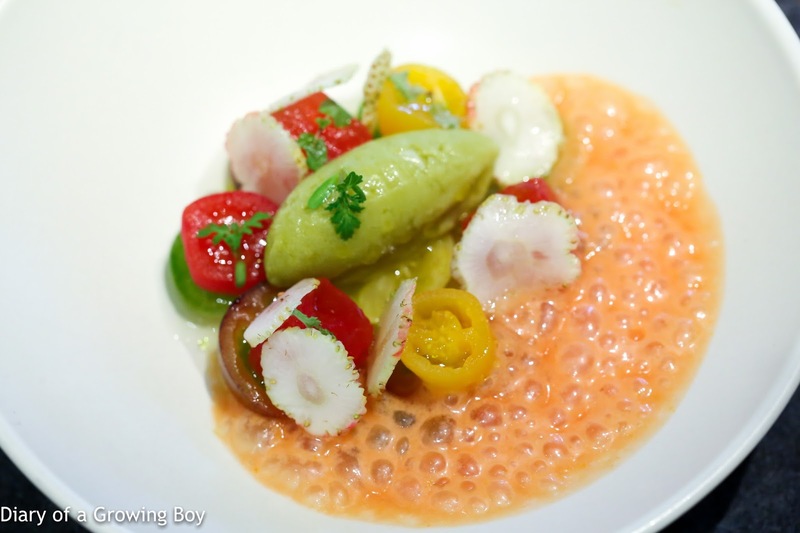 "Green tomato", green curry, green strawberry - we've got different types of tomatoes along with thin slices of crunchy, unripe strawberries - which have become trendy in the last couple of years. Topped with a scoop of green curry sorbet which delivered a liiittle kick, and served with gazpacho foam providing some acidity. Hidden in the pile were also cubes of watermelon that have been curiously marinated to deliver a pretty interesting sweetness. I suspected it was some kind of honey that showed lots of floral notes, but forgot to ask for confirmation. The dish was apparently inspired by tomatoes with ginger sauce (薑汁蕃茄) sometimes served in the southern part of the island. Very refreshing and certainly whets one's appetite. One of mom's favorite of the evening. I normally would open up a bottle of wine for the occasion, and did bring along a bottle from my cellar, but the old fogeys at the table didn't want to drink. 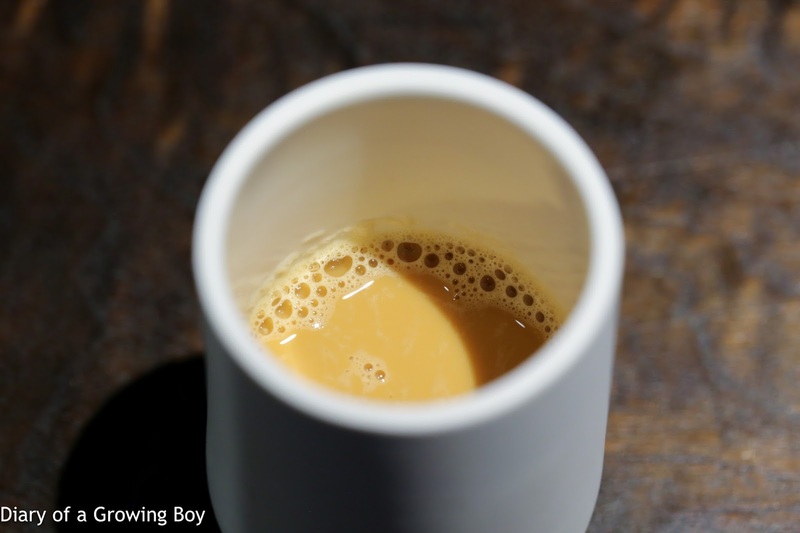 I asked for an introduction on the house "juices (果汁)", and it turns out they weren't the simple and boring kind. I took this one made with housemade elderflower jam, lemon juice, and soda. Nice acidity with carbonation, and floral notes. 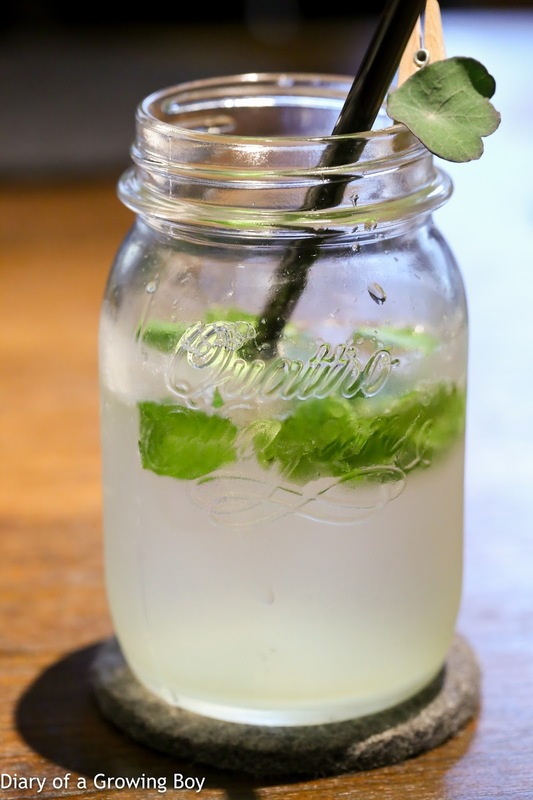 A refreshing drink. Lobster, scallion, dried fish - the baby Green Dragon (青龍) lobster from Keelung (基隆) was served with a satay sauce (沙爹醬) made with crispy flounder (鯿魚酥) and dried mullet roe (烏魚子), as well as roasted Sanxing scallions (三星蔥) from Yilan. The flavors were very Asian and reminiscent of the classic dish of lobsters stir-fried with ginger and scallions, although I thought the sauce was more shacha (沙茶醬) than satay. The seasoning here was a little on the heavy side, but not as salty as I had feared - although it was already beyond mom's tolerance. Those translucent, paper-thin cabbage chips were kinda on the oily side, but damn delicious. 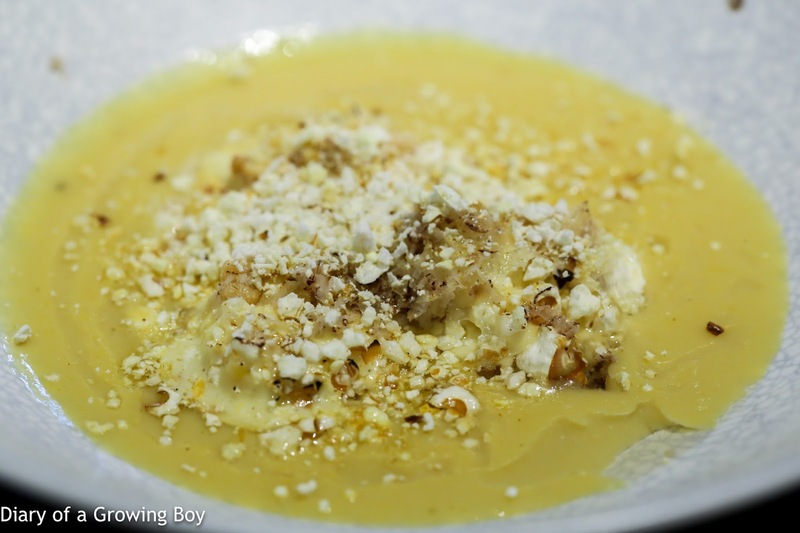 Corn, Manchego, popcorn - corn soup with corn custard, toasted corn, popcorn, some shaved French summer truffle, and a sprinkle of curry-flavored powdered popcorn as the final touch. Sweet, savory, creamy, crunchy, and toasty. 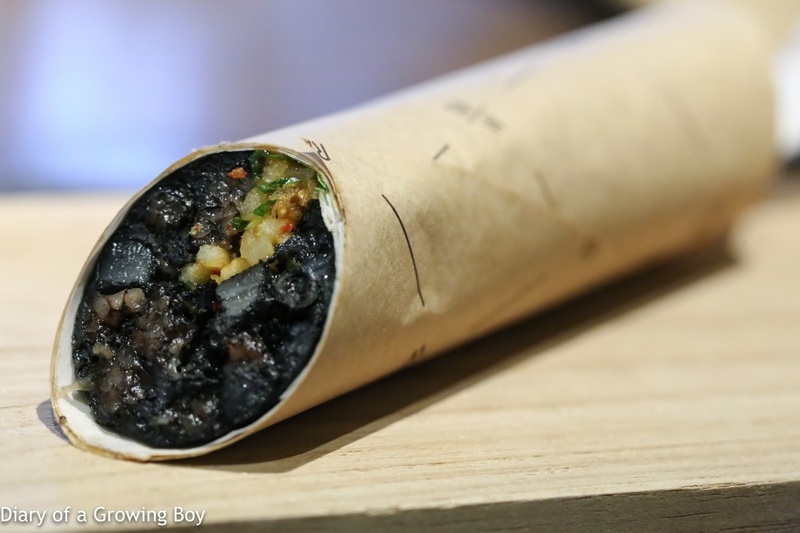 "Boudin noir", magao, apple kimchi - now THIS was interesting... Taiwanese are well-known for their love of the local delicacy pig's blood pudding (豬血糕), and the French have their boudin noir. The traditional spices which go into the French preparation have been replaced by mountain litsea (馬告) from Taiwan. 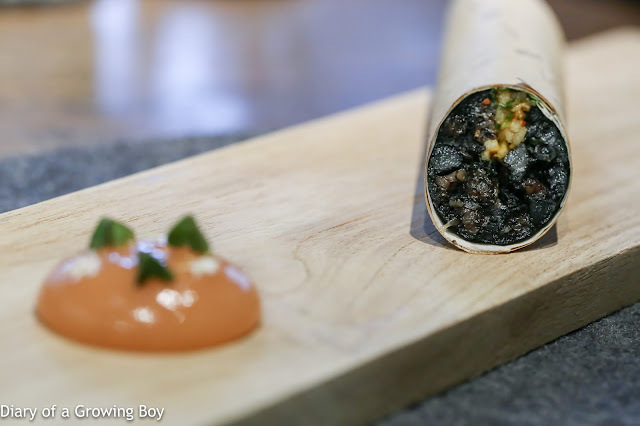 The boudin comes with thin strands of pickles, wrapped in paper and tied at one end - which was meant to be twisted by the diner. 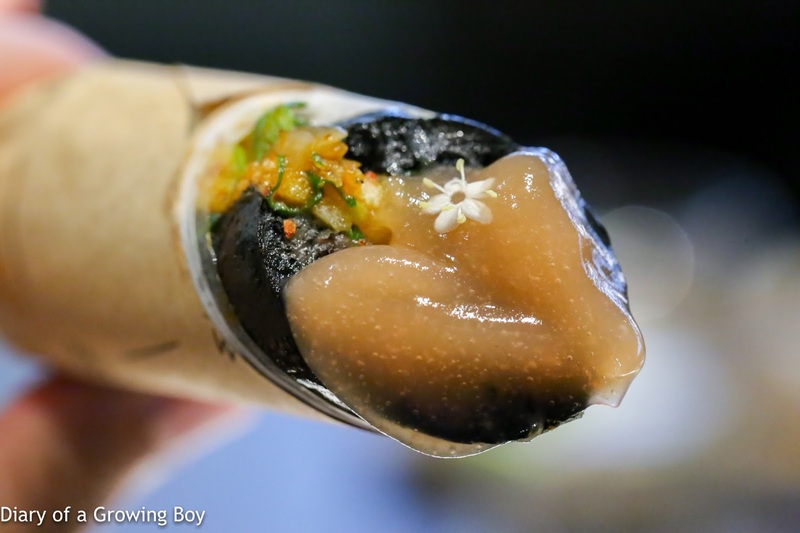 The twisting motion pushes the boudin out from the tube. 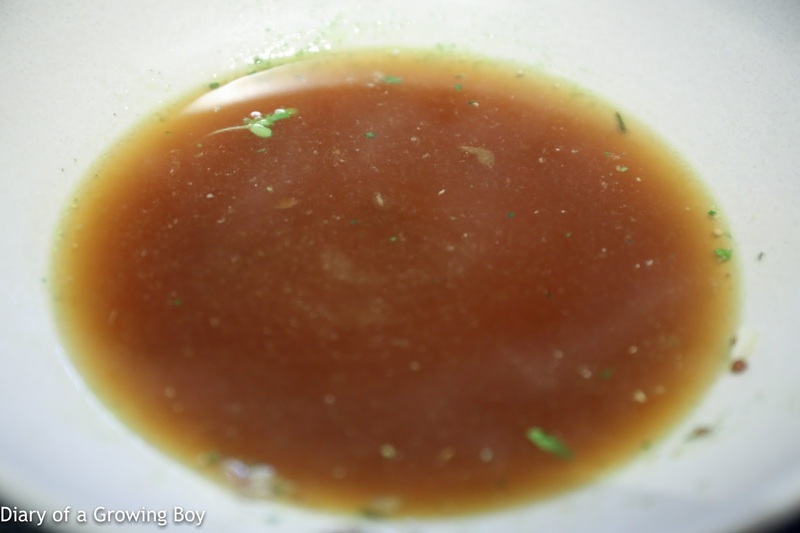 The fragrance of the mountain litsea was pretty faint, and was rather undetectable once some of the apple sauce made with Kougyoku (紅玉) apples from Aomori Prefecture (青森県) in Japan. Still very delicious, though! Osmanthus, peas, seafood rillette - a hodgepodge of sugar snap peas, sea urchin from Hokkaido, cod from Greenland, king crab, onsen egg (温泉玉子) yolk, croûtons, and osmanthus sauce spooned on top. 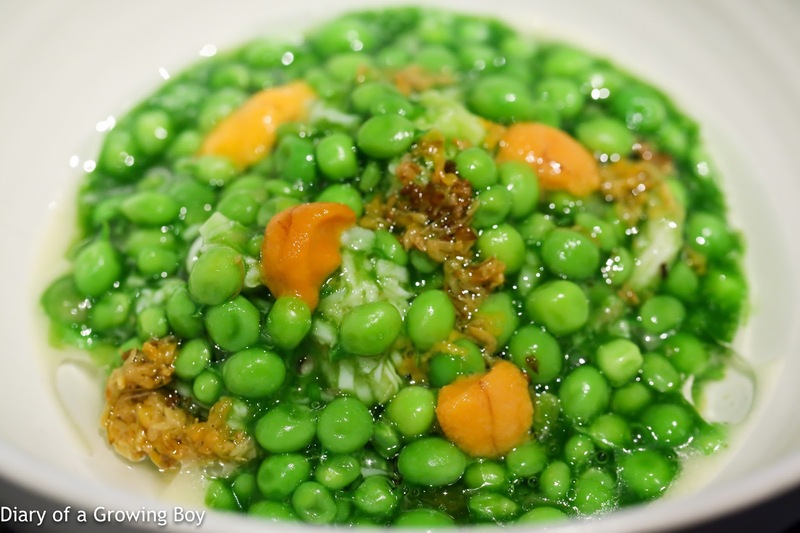 There's the natural sweetness from the peas, sea urchin, and crab, as well as some sugar from the osmanthus sauce. The cod and egg yolk provided the salty flavors. You've got creamy from the sea urchin and egg yolk, crunchy from the peas, and some softness from the cod. All in all, I thought it was a dish that worked well for me... although mom was expecting a little more. 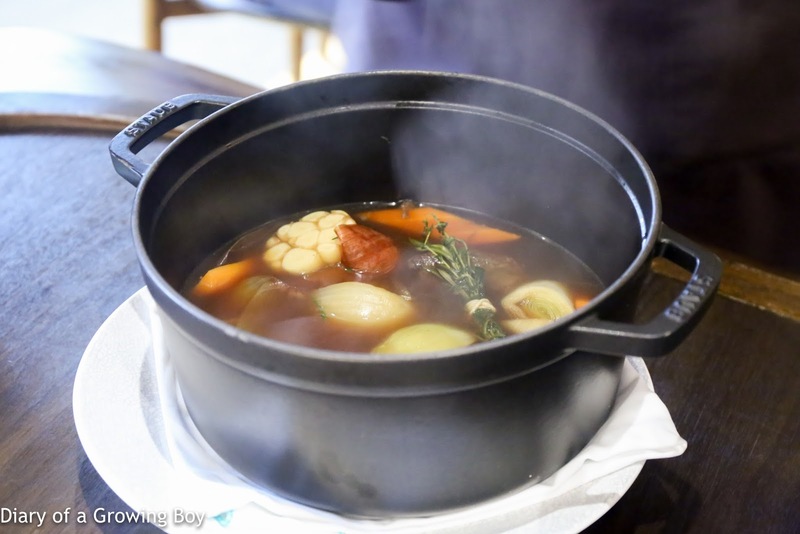 Pot au feu, Taiwan beef, aioli - a very interesting interpretation of the classic pot-au-feu. 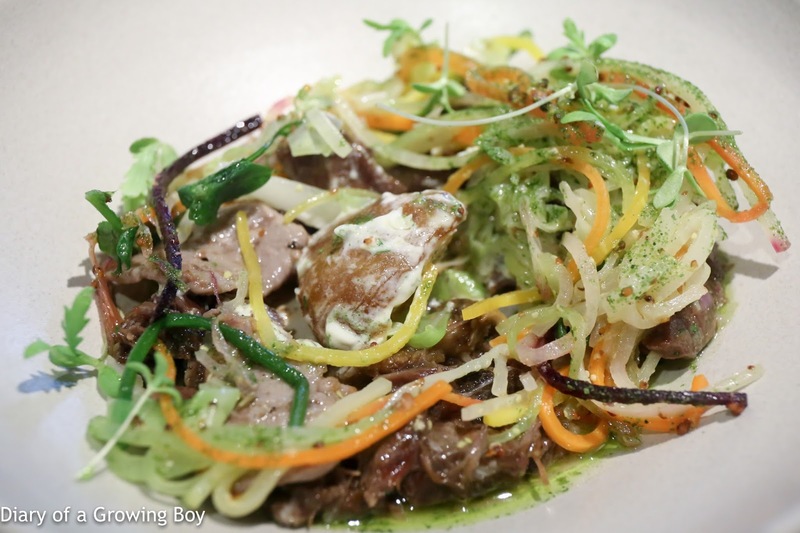 Both slices of sirloin and chunks of beef cheeks are served, with white water snowflake (水蓮), shredded celery, four different types of carrots, and slices of roasted pork on top as "salad"... with some aioli. Pretty good, and the beef cheeks were of course very tender. Mom really liked the veggies. After we were done, the Staub cocotte bearing the veggies and stock was brought out, and I had myself some of the delicious - if slightly full-flavored - broth. 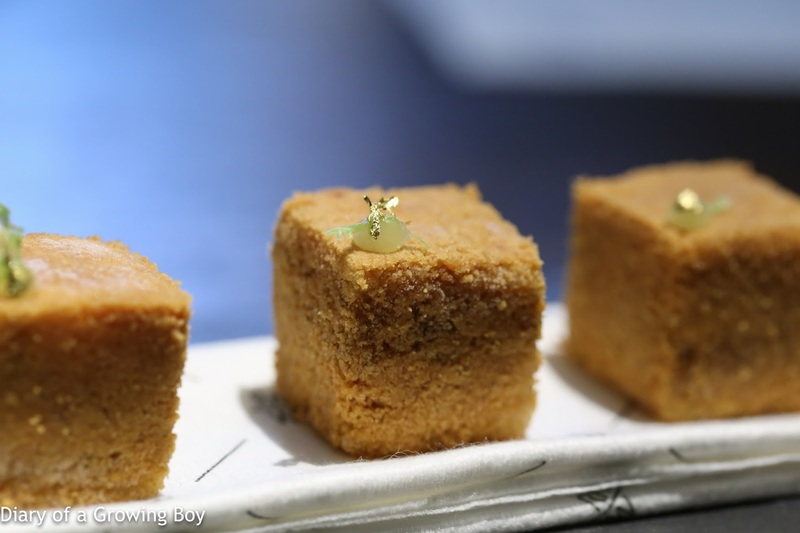 Taiwanese pineapple cake - a specialty of RAW and an extra course compliments of Chef Alain. Served chilled with sour pineapple filling in the middle, and a little dab of lemon gel on top. 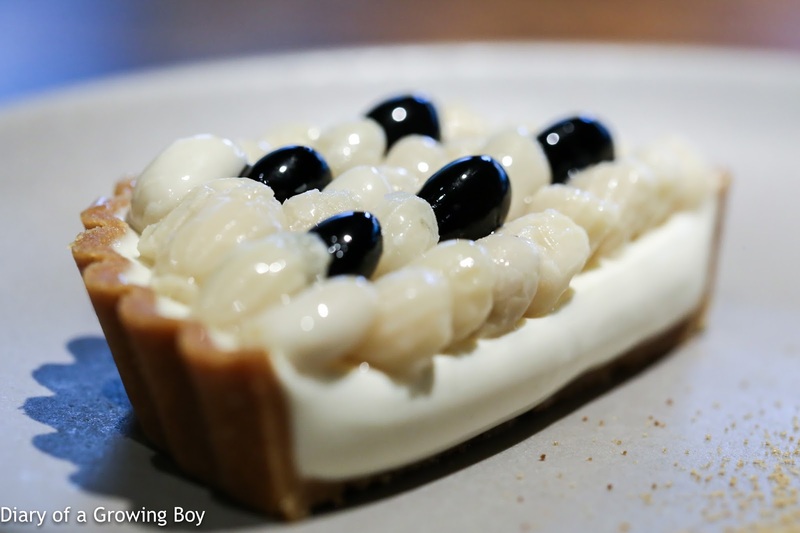 Bean curd, barley, brown sugar - very, very cool presentation. 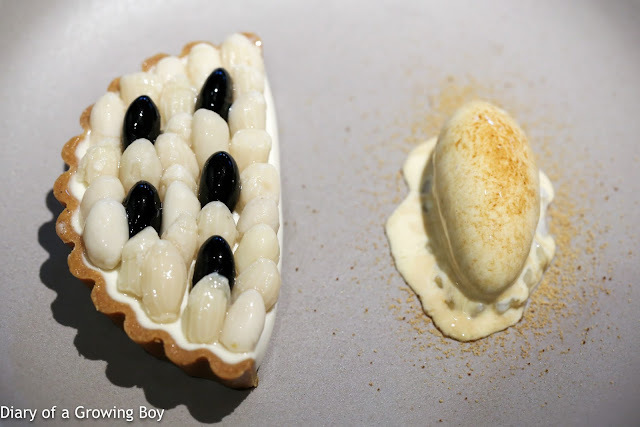 On the right is a quenelle of muscovado ice cream resting on top of some Job's tears (薏仁) cooked in soy milk. I thought the flavors of muscovado was a little on the weak side. The tart on the left came with a custard made with yogurt and sweet bean curd (豆花), whose texture reminded me of panna cotta. Rows of boiled peanuts and black soy beans (黑豆) were neatly arranged on top. Loved both the delicate flavors as well as the beautiful presentation. 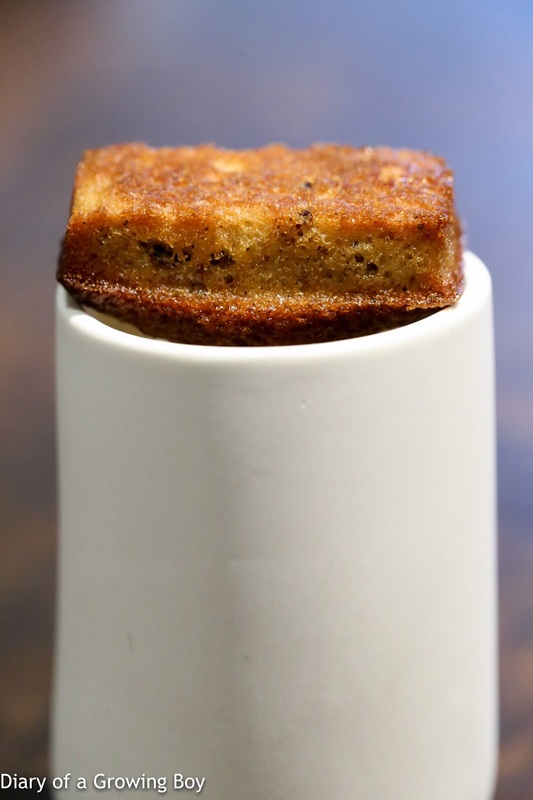 Petits fours - to finish, we were served a drink and something sweet to nibble on. 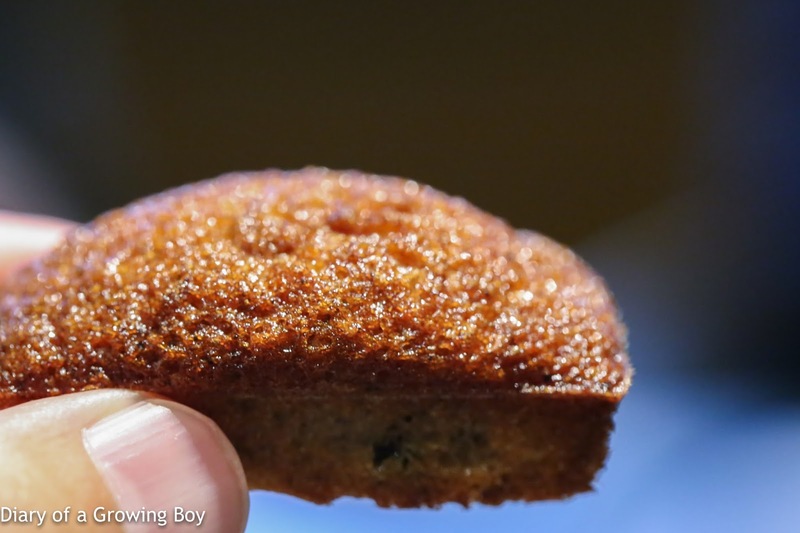 The financier was made with dried lychees from Changhua (彰化), along with some candied ginger. Very nice. Cha yen - apparently meant to be an offering to guests from Sudarampai "Pam" - Andre's Thai wife - but curiously served warm instead of on ice. This was a very, very happy meal for us. 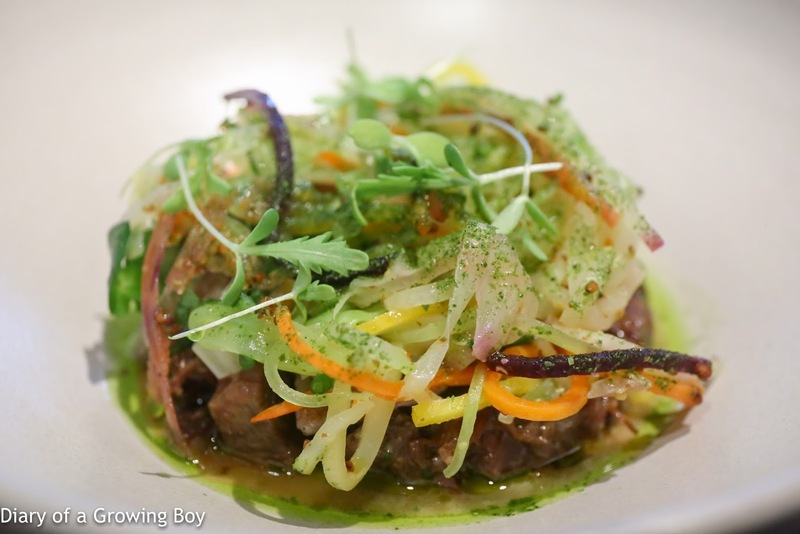 Overall, I thought the collection of the dishes was even better than my last visit almost a year ago. Mom was also very happy, since this meal was much, much better than the one they had a couple of nights ago at L'Atelier de Patrick - at roughly the same price point. Many thanks for Chef Alain Huang for taking such good care of us, and of course many thanks to the friend who helped me secure the table so I could make mom happy.